Dr. Norman Hoffman uses adjusting techniques that are appropriate for you. If you’ve been to a chiropractor before and prefer to be adjusted in a particular way, let Dr. Norman Hoffman know. We want you to relax, enjoy and fully benefit from your chiropractic care. Each color represents differing amounts of nervous system disturbance. One component to our approach to chiropractic is the remarkable Insight Subluxation Station technology. This system has been awarded certification as Space-Certified technology by NASA. This technology allows us to establish a reliable and scientifically valid representation of our patient’s condition. 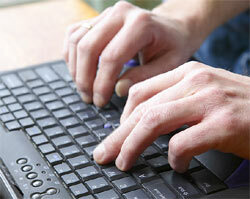 This system is able to detect problems are not measurable by a doctor alone. As you’d expect, this measures temperature. When there are disturbances to your nervous system along the spine, there are often temperature differences from side to side. This is due to inflammation and changes in blood flow. Our thermal scan is non-invasive and reveals the condition of your autonomic nervous system controlling your organs, glands and circulatory system. It is three dimensional – meaning you can do rotation with the patient in the upright position! It is hands-free which leads to a much faster and more accurate exam. It is wireless using Blue Tooth™ technology and has passed all wireless coexistence regulatory requirements. The Algometer enables doctors to obtain accurate information concerning the sensory portion of the nervous system by mapping pressure/pain sensitivity along the spine. The doctor applies pressure to tender areas; the Pressure Pain Threshold (PPT) is determined by the amount of force required for the patient to first perceive discomfort. Previously subjective perceptions can now be accurately measured, mapped and graphically displayed to assess progress throughout a course of care. The Pulse Wave Profiler helps the doctor to determine your overall ability to adapt to stress. It does this by looking at the timing of your pulse, and determining the balance and tone of your nervous system. This exam is known as heart rate variability. Proper balance and tone are associated with better adaptability and a healthy lifestyle. Low heart rate variability is associated with aging and poor heart health. Published research has shown that chiropractic adjustments have a beneficial effect on heart rate variability. Surface Electromyography measures the minute amounts of electrical energy in the muscles along your spine. Subluxations disturb the function of the nervous system. This can produce too much or too little electrical activity in your muscles. We use this highly-accurate, non-invasive scan to document your progress. It’s more accurate than how you feel. The bones of the skull move. Conventional wisdom suggests that the skull is a solid structure, like a helmet, protecting the brain. Yet, the 22 bones of the skull move, with a subtle rhythmic pulsing (about 10-14 per minute) that turns out to be a significant factor in our health. The Cranial Adjusting Technique we use unlocks this surprising, and often overlooked connection. 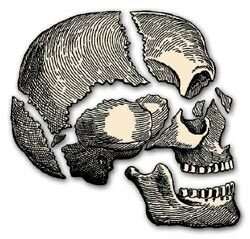 Bones of the skull can often become injured during the birth process. Besides the interruption of the rhythmic pulsing, once the distorted, torqued or warped pattern is established, a compensatory ‘distortion’ can occur along the supporting spinal column below. This can set the stage for a variety of health issues, many without obvious symptoms. The rhythmic movements felt along the joints of the different bones of the skull, called sutures, can be felt with the fingertips. Restrictions are thought to interfere with the normal circulation of cerebrospinal fluid. This fluid serves as a ‘shock absorber’ for the delicate tissues of the brain. By detecting aberrations, we can uncover the underlying cause of many ailments, especially those of the jaw and other parts of your head. Those who have had traditional chiropractic care often remark that after receiving Cranial Adjusting, there is a better resolution of their chronic spinal subluxations. Carpal tunnel syndrome is a common result of repetitive motions to abnormally functioning joints of the spine, arm and wrist. Chiropractic can be helpful. Classic tennis elbow (lateral epicondylitis) is a repetitive strain injury that often afflicts the dominant arm. It is seen among carpenters, mechanics, office workers, cashiers and those who perform repeated hammering, grasping and rotary forearm motions. A thorough examination followed by appropriate chiropractic care can produce excellent results. A lack of health indicates a chemical, mental or structural imbalance. 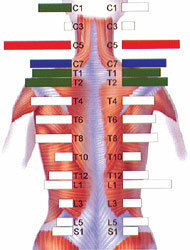 The ancient Chinese observed that every muscle in the body links to a specific organ, gland or acupuncture meridian. By testing the strength of its related muscle, we get a glimpse of the condition of that particular organ or tissue. Simple muscle testing helps us uncover the structural, chemical and mental problem that may be in your body. It can also direct us to the best options to restore your health. First, we review the history of your health situation. This is followed by a thorough physical examination. Instrumentation and laboratory tests may be needed. Then we analyze your posture, the way you walk, turn and bend. By combining these findings with muscle testing, we develop a unique insight into the cause(s) of your problem. 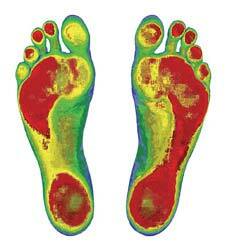 Scans of your feet reveal pressure points, loss of arch and other critical information. It surprises many that we will often focus on the feet, when the problem seems located in the neck or lower back. Yet, your pelvis and feet are the foundation of your spine. Problems in one area can create compensatory problems in the other. 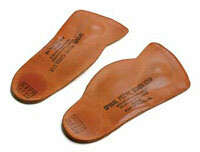 Remove the innersoles that come with your shoes and replace them with comfortable, supportive orthotics. First, an analysis of the spine is performed. This can initially involve a case history and X-ray pictures of the spine. With the malposition of one or more spinal bones identified, a specific manual thrust is administered. The direction, speed, depth and angle that are used is the result of experience, practice and a thorough understanding of spinal mechanics. The energy delivered during the thrust may produce a slight “popping” sound from shifting gas and fluids in the joint. This sound may be interesting, but has little meaning as to the value and effectiveness of the adjustment. Named after its developer, Clarence Gonstead, this approach came from his engineering background. His “foundation principle” explains how a subluxation pattern in one area of the spine can produce compensatory changes in another. Sometimes you’ll hear a slight “popping” sound that we call cavitation. After gently lowering you to a prone position, individual drop pieces give way, reducing the amount of energy needed to adjust the spine. Individual cushions or “drop pieces” located along the table surface, support each area of the spine until the thrust is given. Then, each drop-piece gently gives way, reducing the pressure needed to move a specific spinal segment. The primary intent of Torque Release Technique is to reduce blockages and tension of the entire spinal system, to release trapped unresolved patterns in the body/mind and facilitate reintegration of the nervous system, allowing a greater expression of ones healing and performance capabilities. Upper Cervical adjusting is a little-known chiropractic procedure that corrects the position of the top vertebrae of the spine, the atlas and/or axis. By correcting the tilt, shift or rotation of these vertebrae, the effects of many conditions can be minimized or eliminated all together. When the atlas and/or axis are out of their proper position, the head moves off center of the body. This creates body imbalance from head to toe. The most serious result of an atlas and/or axis being out of position is the restriction or distortion of critical messages from the brain to ALL parts of the body. The repositioning of the atlas vertebrae is done by hand or by instrument. There is no twisting of the neck. It simply restores body balance and brain-to-body communication so that organs, limbs and tissues can resume normal functioning. It is becoming increasingly clear that parents should have their children’s atlas’ examined as soon after birth as possible and have periodic atlas check ups throughout their lives. Countless problems could be avoided entirely. A rightly positioned atlas is so fundamental to good health that children to grandparents need to get their atlases examined now.